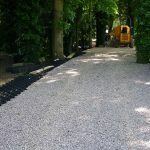 In spring 2016, Geosynthetics were contacted by Robert Yates of RGS Arboricultural Consultants regarding a new driveway in Oakley, Bedfordshire. The proposed route for the driveway passed through the root protection areas (RPAs) of numerous trees which were to be retained. In order to maintain the health of the retained trees, a no dig drive would need to be constructed. The Cellweb Tree Root Protection system is specifically designed for the construction of new hard surfaces within RPAs. It is installed on the existing ground surface, which removes the requirement of excavation and therefore prevents root severance. The system allows continued water permeation and gas exchange by confining an open graded clean angular stone infill material. The system is also extremely effective at spreading point loads and reducing the load that is applied to the soils beneath. This in turn minimises soil compaction, maintaining an open soil structure which allows continued gas exchange, water permeation and migration. Geosynthetics Cellweb TRP Technical Specifier met on site with Robert Yates of RGS Arboricultural Consultants and Warin Larkin of Larkin Homes. 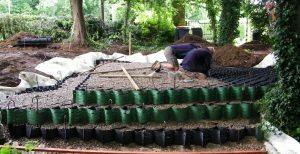 Most of the proposed route was over level ground which would lend itself to a relatively simple specification and installation, utilising a single layer of the Cellweb Tree Root Protection system. The entrance of the driveway was created once they had removed a section of the hedge to open out onto the highway. Within this hollow sits the RPAs of several retained Horse Chestnuts and a large Yew. As a rule of thumb a single layer of the Cellweb TRP system should not be laid on a gradient greater than 1:10. 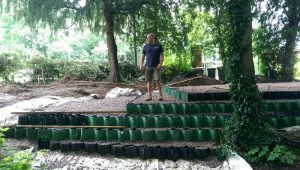 The client had also requested that the driveway was to be level, and these factors combined meant that the hollow would need to be infilled. Due to the presence of RPAs this would need to be achieved using a technique whereby the Cellweb TRP system would be stacked or layered in the hollow to achieve the required build up. During the site meeting, Larkin Homes measured the depth of the hollow at its deepest point and the span of the hollow at its widest point. The remaining area of level driveway was measured and information on the proposed traffic loadings was obtained. This information was then provided to Geosynthetics in-house engineering team so that they could prepare a site specific recommendation for the driveway build-up. The engineering team at Geosynthetics prepared two recommendations, one for the level section and another for the remaining hollow section of the driveway. Diagram 1 shows the recommended build-up for the level section of the driveway. The 200mm deep Cellweb TRP was recommended based on the proposed traffic loadings and an assumed California Bearing Ratio (CBR) value of 1 per cent. Actual CBR values for the site were unknown as no ground investigation reports were sourced by the client. Geosynthetics in-house engineers also provided a longitudinal cross section (diagram 2), which provides an indication of how the Cellweb TRP could be layered to achieve the required build-up and infill the natural hollow in the proposed route for the driveway. This could be achieved using five layers of 200mm deep Cellweb TRP. Having produced the drawings, Geosynthetics were able to provide approximate quantities of the materials required for both the level area and the hollow infill. Based on this information, the Cellweb TRP internal sales team were able to produce a quotation for materials to be delivered direct to site. Both the technical recommendations and the quotation were sent to Warin Larkin of Larkin Homes. Geosynthetics also provided a stone specification to enable Larkin Homes to source the correct stone. On delivery of the materials, Larkin Homes began the installation of the new driveway, working from the new development towards the existing highway. The level part of the new driveway was installed first. Having installed the flat section of the drive, the installation had reached the hollow section. Some minor excavation was carried out to prepare the bottom of the hollow for the first layer of Cellweb TRP. This was done under the supervision of RGS Tree Consultants who ensured that there was minimal root disturbance. This created a flat and level surface on which the installation could begin. The first layer of Cellweb TRP is being installed onto the bottom of the prepared hollow. 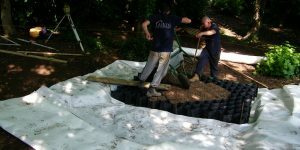 The area was first lined with Treetex geotextile which acts as a separation layer and a pollution control measure, in accordance with BS 5837 2012. The Cellweb TRP was then pegged out over the top. As this was surrounded by unprotected RPA, no plant could be tracked through at this stage, so the infill was completed by hand. The 200mm thick layers of Cellweb are stacked on top of one another in order to achieve the required build up. By offsetting each panel by one cell, a terraced or stepped effect has been achieved. The Cellweb TRP requires no retaining structure and the outer cells can be emptied of stone and infilled with topsoil. Soil can then be banked up the terraces and can be seeded to create a vegetated bank. This is a simple but effective method of hiding the exposed Cellweb. This project is an ideal example of how Cellweb TRP can be stacked to overcome a natural change in levels. The information provided at design stage in order to calculate a site specific recommendation was crucial to the overall success of the driveway. The engineered attributes of the tried and tested system made this the perfect solution and the method of installation guaranteed minimal excavation, preventing root severance, and the open graded clean angular stone infill aggregate ensured continued water permeation gas exchange between the atmosphere and rooting environment. For more information on Geosynthetics click here. Previous : Are Apprentices the Solution to the UK’s Skills Gap?